An investigation into Monday’s Amtrak derailment crash near the east coast of the United States by DuPont that killed three and sent 72 individuals to hospital is closely examining the speed of the high-speed train. While all train carriages have been searched and the highway vehicles emptied, officials have not ruled out a rise in the number of those dead, with several of those injured reportedly in serious condition. Spokeswoman Bella Dinh-Zarr for the National Transportation Safety Board, or NTSB, told news media that investigators who arrived on Monday evening local time would likely be on-scene for a week to 10 days. President Donald Trump’s initial reaction to the crash was to send out a tweet Monday afternoon that the derailment was a reason why his coming infrastructure plan is needed. 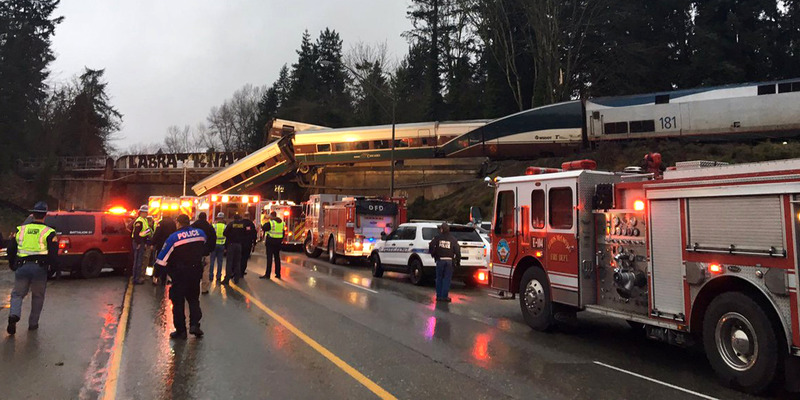 “The train accident that just occurred in DuPont, WA shows more than ever why our soon to be submitted infrastructure plan must be approved quickly,” Trump posted. The president tweeted ten minutes later his “thoughts and prayers” over the incident, saying the White House was monitoring the situation. Washington Governor Democrat Jay Inslee declared a state-of-emergency for two countries over the crash. In Inslee’s latest tweet, he said is it “heartbreaking that fatalities have been confirmed” for the derailment crash in Pierce County. Train 501 had left Seattle on heading southbound for Portland at 6 p.m. local time, and was about 45 minutes into its journey when it derailed with 77 passengers, seven crew and a single train technician. 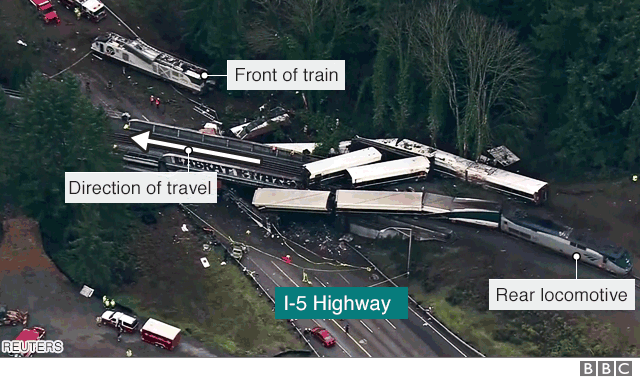 Washington state transport spokeswoman Barbara LaBoe was quoted by the local Seattle Times as saying the limit on most of the track was 79 miles per hour but drivers were supposed to drop speed at the spot where the train derailed. Passengers told reporters and posted on social media that the train rocked back and forth as the high speed train took the bend, sending carriages airborne off the bridge on to the highway below. While there were several injuries as five vehicles and two buses were struck on the highway, no deaths occurred in traffic. Nineteen individuals were taken from the scene of the crash uninjured, with 10 of the 72 hospitalized considered in serious condition, according to local police. The derailment took place on a section of track previously only used for freight trains. A safety system called Positive Train Control was not operating on the train, Amtrak’s President and Chief Executive Officer Richard Anderson told reporters. PTC utilizes GPS tracking to warn the driver of speed limits and takes over the brakes should the warnings be missed. The U.S. Congress legislated for the rail technology to be installed by the end of 2015 but its installment is not even halfway complete nationwide, according to local media. An Amtrak official told BBC News that the company would “do everything in our power” in supporting passengers, employees and families affected by the crash, saying they would “spare no expense”. Amtrak runs the majority of the national passenger trains in the United States with some funding from Washington. More details to follow. Image 1 of the scene from Business Insider.